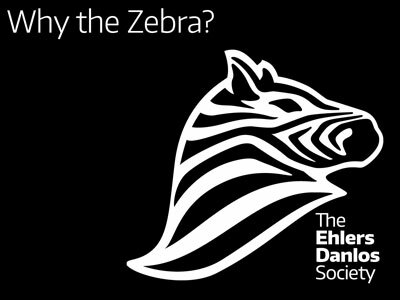 People with the Ehlers-Danlos syndromes and hypermobile spectrum disorders (HSD) often identify themselves as zebras. Medical students have been taught for decades that, “When you hear hoofbeats behind you, don’t expect to see a zebra.” In other words, look for the more common and usual, not the surprising, diagnosis. But many of us spend years pursuing a diagnosis for disorders that aren’t well known. Or aren’t expected in someone who looks normal, or is too young to have so many problems, or too old. Or even, what we might have is considered too rare for anybody to be diagnosed with it. So the zebra became our symbol to mean, “Sometimes when you hear hoofbeats, it really is a zebra.” Ehlers-Danlos syndromes are unexpected because they’re rare. Hypermobile spectrum disorders are common, but are unexpected because they remain misdiagnosed or under-diagnosed. When you see a zebra, you know it’s a zebra—but no two zebras have identical stripes just as no two people with an Ehlers-Danlos syndrome or HSD are identical. We have different symptoms, different types, different experiences—and we are all working towards a time when a medical professional immediately recognizes someone with an Ehlers-Danlos syndrome or HSD. A group of zebras is called a dazzle. We are a community of individual zebras, we are stronger together, and we dazzle. A one-sheet PDF click here. Video (.mp4 format, 50.9MB) click here. High-quality uncompressed video (.mov format, 784MB) click here.